After much agony, introspection and discussion, I am finally at peace with the fact that there are some things I just can’t understand at this point in my life. Nothing heavy-handed here, folks. I’m just talking about a public fresh-food market. But that comes later in this entry. On June 28, Jeff and I met my brother’s fiancee and one of the other bridesmaids at the Basilica of the National Shrine of the Immaculate Conception. After we wandered around the largest Roman Catholic church in North America, we hopped on the Metro and explored Eastern Market, which had just reopened for the first time in more than two years. 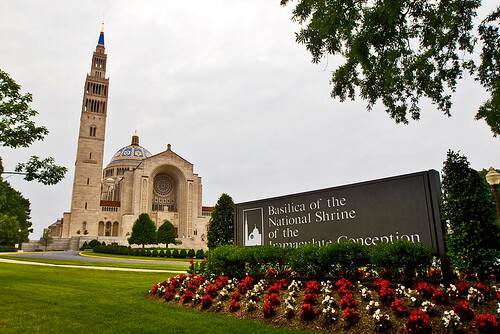 But first, here’s the basilica, which is a short walk from the Brookland-Catholic University Metro stop on the red line. The exterior of the basilica. Quite impressive. Religious architecture has always bewildered me, but it sure is pretty. I was surprised about access within the building. Jeff and I just walked right in and ambled around. I had the feeling that as long as we didn’t disrupt any of the ongoing services in a few of the sanctuaries or enter any private offices, we had free reign of the place. It was a Sunday, for goodness’ sake, and we were wandering the upper church and clicking our DSLRs. View from the altar. I would be more descriptive, but religious architecture terminology is beyond me. Opening weekend at Eastern Market. Photo by Jeff. I don’t mean to come off as a non-native/bright-eyed intern who comes to town and tries to ingratiate herself with the locals (or, worse yet, poke fun at them). Nor do I want to seem like a blissful ignoramus whose mantra is “I don’t get it.” Rather, I relish learning, trying to understand and passing on knowledge and information. That’s just what I aim to do as a (photo)journalist. But sometimes, I just don’t understand things as completely as I’d like. Whether the “thing” is a mechanism, concept or none of the above, sometimes it completely eludes my mental grasp. This frustrates me so much, especially because I love being a (photo)journalist, and among other things, I want to understand why so many people from so many backgrounds are drawn to certain ideas or places. Ideas such as public fresh-food markets. Places such as Eastern Market. Eastern Market, located on Capitol Hill, is a public market that has served the community since 1873. Vendors sell fresh meats, produce, flowers, baked goods, cheeses and other yums every day of the week, and on weekends, the surrounding area features a farmers market and artists’ stalls. 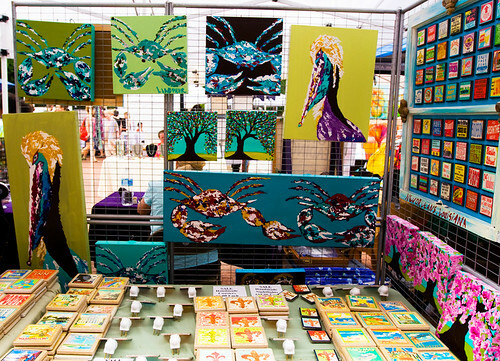 An artist's booth outside of Eastern Market. Crabs and coastal fauna are kind of a big deal in the area. Me: Who actually buys things there? Do people come all over for the products? Or is it just like a big neighborhood relic that everyone cherishes? I just don’t understand the appeal. Is it just Capitol Hill people who go there? Jeff: What do you mean, you don’t understand the appeal? Me: There are grocery stores and roadside produce stands all over the place. What’s the appeal in Eastern Market? I’ve just never seen a public fresh food market, so I don’t understand. Jeff: The majority may be Capitol Hill people — there are not that many grocery stores in D.C. at all, actually, and even fewer roadside fresh produce stands. Other people come for the experience, to socialize, to see people, to eat lunch at the cafe there, shop the flea market, etc. It’s just sort of an institution — it’s the last of the old public markets in the entire city. Me: I guess this is what living in the suburbs has done to me. Farmers markets were foreign to me until I was 11. It’s just strange to me that people would use it as a means of social interaction. It seems like it’s more or less the same thing every day and then every weekend. It seems like it’d be just routine for people. Then Jeff gave his best shot at trying to explain Eastern Market to a girl from the urban South. Jeff: The market itself is a living, breathing community. The workers there have been maintaining shops that have been in the same families for decades if not a century or more. They all have friends and longtime customers that patron their businesses. When the market burned down, those families and that sense of community were completely devastated. Many people lost their entire lives and source of income for years, and he residents had nowhere nearby to shop. Then it was rebuilt, and that was restored. That’s why it was packed shoulder-to-shoulder and busy and vibrant and jubilant. I’d argue the country needs more places like that and fewer Safeways and Wal-Marts. But that’s just me. After that, I understood Eastern Market a little better. But I don’t think it’ll ever be something I can fully appreciate as a cultural standby in an old community. I’m too used to the Kroger across the highway from my Houston neighborhood, or the Wal-Mart my roommates and I visit via a winding two-way road. Mom-and-pop shops are not beyond my understanding, but big public markets in an old, somewhat urban neighborhood certainly are. But I do understand enough to agree with Jeff. The world needs more places like Eastern Market. Here is a Washington Post article written lovingly about Eastern Market the day after it burned down in 2007. 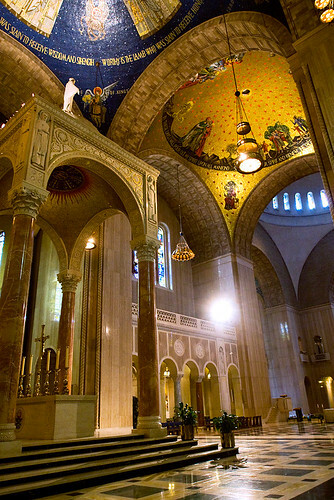 View more photos of the basilica, Eastern Market and this past summer.